Google's been known to throw the spaghetti at the wall to see what sticks. And for every GMail and Android, there's a Wave and Buzz. At best, Google's Chromebook initiative is valiantly clinging to the wall, lost ground not withstanding. 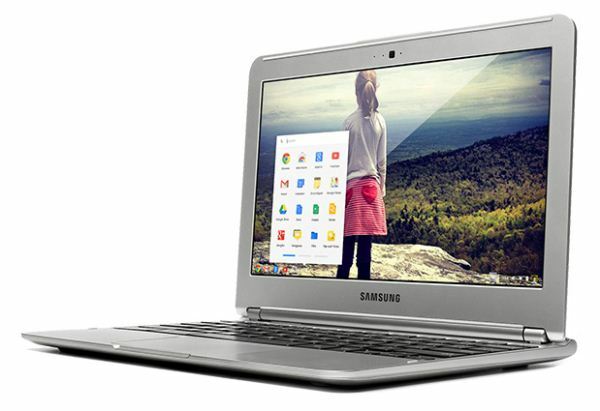 Today, they've unveiled their latest Chromebook collaboration with Samsung, and it's frankly quite exciting. 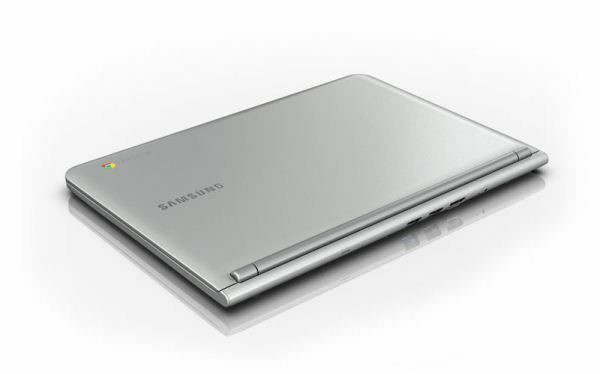 The 11.6" notebook weighs in at just 2.5 lbs, and gets to be the first device sporting Samsung's Exynos 5 Dual (5250). Sound familiar? That would be the first ARM Cortex-A15 SoC to show up in a commercially available device, and the first potentially mainstream ARM based PC to hit the market. The rest of the specs are relatively modest, the 11.6" panel has a respectable 1366x768 resolution, a VGA camera, SD card slot, one each USB 3.0 and USB 2.0 ports, and an HDMI port. Bluetooth and WiFI are built-in, though this generation foregoes the 3G modem of the first Chromebook. Some noise has been made about the quoted 6.5 battery life; we've never taken too much stock in PR provided data. The Cortex-A15 can be a power hungry SoC when stressed, and there's no details on battery capacity, so we'll have to handle the hardware ourselves to size up the battery life. The SSD is a zippy but small 16GB, but local storage isn't really the point of a cloud-centric Chromebook. And to help allay storage fears, Google's including 100GB of Google Drive capacity for 2 years, with the the purchase of the $249 laptop. That additional cloud storage sweetens the value of the device, too; paying for the service out of pocket would cost $120 over the two year span. So, is this the Chromebook that will finally win us over? We'll find out soon, preorders start today, and sales start Monday. Update: Turns out a 3G option is available, though unannounced. Service is included in the cost of the device for 2-years, up to 100MB a month, and is provided by Verizon. The 3G SKU will cost you $329, and is available for pre-order now. Also, I misspoke on the matter of this being the first ARM based PC, I hope the edit adds some clarity. however, if we set my assumptions aside and consider your argument, I will point out that the MBA has four times the budget to put into each component, allowing them to fine tune each component to use as little power as possible, and the battery is LiPo instead of Li-Ion, plus a better quality display panel can draw significantly less power. The same could be said to a lesser extent of WiFi and Bluetooth. Apple is a master at their craft. lithium polymer batteries ARE lithium-ion. The major difference is that in a traditional Li-ion battery, the electrolyte (a lithium salt) is held within an organic solvent, whereas with a Lithium-ion polymer battery, the electrolyte is held by a polymer. According to modern convention, while a lithium polymer battery may indeed be a lithium ion battery, people refer to advanced polymer batteries as polymer and more generic lithium batteries as ion. Possible. Can't say I know the last time I saw a product where the battery estimates undercut the actual time you get. Apple usually got fairly spot on with their, most other companies exaggerate a lot (or simply don't test under reasonable conditions). The display backlight consumes most of the power. Both have the same display resolution, thus equal display backlight, thus their display should consume about the same power. Most of the other internals consume similar power, too. The SSD in the Macbook air idles while web browsing so no real difference here either, the Air has more RAM, but the difference is maybe 0.2W in the end. So 2W more for the SB i5 while idling, sounds reasonable for me. We also don't know how Google measured the battery life. While idling, web browsing, movie playback, what display brightness? It's called "race to idle." While the SB i5 in your MacBook Air uses a lot more power under load than a Cortex-A15, it's also leaps and bounds more powerful. Therefore, it gets its work done faster and returns to the all-important idle state sooner, allowing for better battery life in a simple workload like web browsing. Chromium Browser is being fully optimized for online use on ARM A15. The mainboard design, bandwidth, i/o, power usage, SSD are being optimized for this purpose as well. The SSD powers down and A15 throttles down for online use to save on Mali 605 GPU power usage. While doing general web browsing, we can expect to get much longer power usage and that's what they've been shooting for with this first ARM powered Ultrabook! Consider this; at $249 the Samsung ARM Chromebook is an excellent deal and no doubt, at this early stage has lots of room to be optimized and you may find some of his claims a little too outrageous. But he's made them before and been right the majority of the time. Right now that future 20 hour usage on this ARM A15 Ultrabook may sound ridiculous, but we haven't seen even half of what ARM and Samsung have put into the Exynos Processor. Pretty much the same here with my 2011 13" base MBA.